From April 29 to May 1 this year, marketers from every industry gathered in Nashville, Tennessee to attend Marketing United, a conference hosted by email marketing innovator Emma. 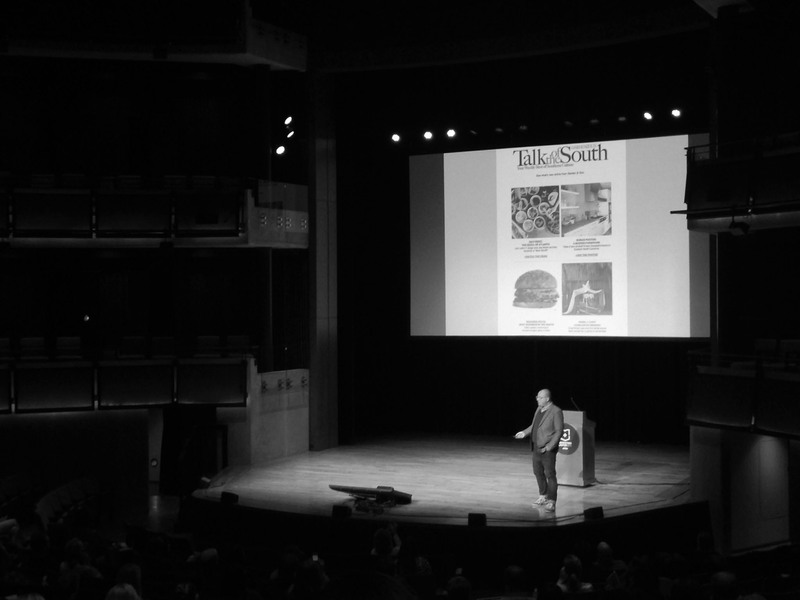 Conference sessions covered nearly every aspect of digital marketing — from SEO to branding — and included speakers from brands such as Warby Parker, Life Is Good, Garden & Gun, Nissan, Hatch Show Print, Third Man Records, and more. A few of the staff members from our Nashville marketing agency were lucky enough to take part in Marketing United and compiled notes from the top sessions to share. We live in a world of constant distraction. In 2015, the average attention span is only approximately 8.25 seconds — a substantial decrease compared to the 12-second average in the year 2000. This creates unique challenges and opportunities for marketers. Furthermore, between smartphones, incessant emails, and the latest TV show, it’s no secret that your audience’s attention is fragmented at best. With so many distractions in modern life, your brand not only competes with other companies vying for consumer attention but also with entertainment, family needs, various interests, and responsibilities. Companies can spend millions of dollars to reach customers but rarely receive the desired return on investment. At Marketing United, Jay Baer’s session, “Youtility: Why Smart Marketing Is About Help, Not Hype,” shed light on how great marketing rises above this constant buzz by being helpful and intelligent. One easy way to reach potential clients and customers by applying this principle is to connect with them during the research phase of a purchase or decision. Consumers have more research tools at their disposal than ever (e.g., smartphones). In fact, the number of sources of information viewed pre-purchase nearly doubled from 5.3 sources in 2010 to 10.4 in 2011 and continues to rise. This customer hunger for information presents a fantastic opportunity to be a resource for consumers and establish your company as an authority in your niche. Answer questions. Consumers and potential clients research now more than ever before. Use blogs, white papers, and other forms of content to answer common questions and concerns about your product at every stage of the sales process. The better you teach, the easier it is to sell. Investing time and effort in great content helps educate your customers and wins their trust, making sales easier to close. Great content goes a long way. Videos, blogs, white papers and various other forms of helpful content are not only helpful for customers and clients, but also provide other benefits such as attracting natural links to your website and supporting search engine optimization (SEO) efforts. One of the most entertaining sessions at Marketing United was “Unselling: The New Customer Experience,” hosted by Scott Stratten of UnMarketing. He covered quite a bit of ground but his most impactful insights were related to brand interaction. Social media, review sites, and other online forums have given consumers a voice that can’t be ignored. For companies and brands, this can be their worst nightmare or an invaluable resource. 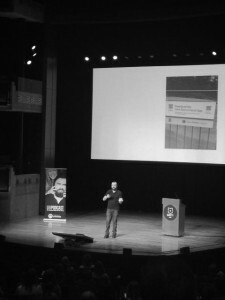 Scott Stratten from the UnMarketing podcast telling great (and entertaining) stories about how to make brand interactions count. In many ways, marketers are still discovering how to use social media effectively for businesses and brands. Many businesses mistakenly treat social media as a “source of leads” or strictly as a sales tool. The real purpose of social should be to foster community, build loyalty, and be helpful — activities which often have sales as byproducts. Rather than using it as a log for a constant stream of sales posts, social can be leveraged for great customer service and personal interaction. Every brand interaction is either good or bad. Whether it’s a complaint, feedback, or a positive comment, your customers are telling you something. Listen! Complaints are great feedback. Remember that every complaint is a “cry for help.” Consider what a disappointed customer is attempting to communicate, understand the cause of the problem, and use that information to make your brand better. The best marketing happens after the sale. Show your brand cares even after the sale. If there is an error or product malfunction, be quick to take care of your customers and make it right. This is key to building loyalty and growing a customer base that will be happy to pay for your product or service and tell others about it. Email marketing continues to be a big part of any digital marketing mix, especially when it comes to lead nurturing. Emma’s Christopher Lester hosted a session on email marketing loaded with great information on how our brains are wired to look and click when it comes to email. Emma’s Christopher Lester discussing how modern email marketing is part art, part science. Understanding how the brain works and using it to create a great mobile experience is a perfect combination of science, analysis of consumer habits, and smart marketing. A highlight of Lester’s session was a discussion of the Von Restorff effect and how one can use the brain’s natural patterns to create beautiful, impactful email campaigns. One of the most interesting statistics from the session was that 80% of people only scan their emails, rather than read them. Curating content that’s short and easy to read quickly, such as by using lists and bullet points, will help with engagement. Another fascinating part of the session centered around color subtle power to send messages and encourage action. When choosing color schemes for buttons and calls to action, consider the psychology of color in relation to your message. For example, yellow is associated with anxiety while blue conveys security and trust. The color scheme you use should reinforce the text content. Keep in mind is that you aren’t just competing against other brands/competitors but also competing against other emails in the inbox. A 14-point font is optimal for email, which is mostly opened on mobile devices. For foolproof click-throughs, use call-to-action buttons that are 46px squared, which is the average size of a fingertip. Unclutter your emails and take advantage of “white space,” a proven way to increase comprehension by 20%. Use short subject lines to catch users’ attentions. Keep in mind that 28 characters is the sweet spot and iPhones cut off subject lines that have more than 32 characters. Marketing United was a great experience. We learned a lot and connected with other marketers in a variety of industries and sectors. Covering all things digital, from SEO to brand experience, the conference gave an overview of the direction that modern marketing is taking and offered suggestions for how we can continue to grow as marketers. We can’t wait until next year. We hope to see you there. In the meantime, please share your marketing insights with us by leaving a comment. Let’s continue the discussion!